Photo by Jerry and Marcy Monkman, EcoPhotography provided by Society for the Protection of New Hampshire Forests. Select image for larger size. Acquisition History: Muchyedo Banks WMA was acquired by Fish and Game through a partnership with The Society for the Protection on NH's Forests, which continues to hold a conservation easement on the property. Funding was secured from the US Fish & Wildlife Service, Town of Canterbury, The New Hampshire Land and Community Heritage Investment Program (LCHIP), New Hampshire Department of Environmental Services Aquatic Resource Mitigation Fund and the National Oceanographic and Atmospheric Administration (NOAA). Photo by Jerry and Marcy Monkman, EcoPhotography. Description: Muchyedo Banks WMA is prized for its scenic forested shoreline and unusual sand plains. 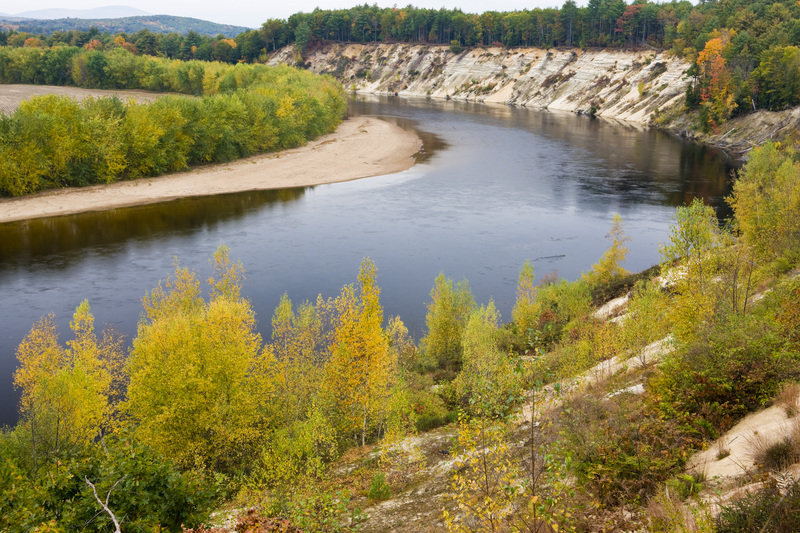 The “Muchyedo Banks,” a pair of 60- to 80-foot high sand banks that rise from the river, are the property’s most stunning landmarks. 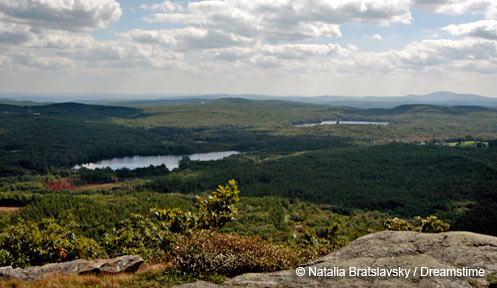 The dry river bluff, sand dunes, and silver maple floodplain forest are all identified as high priority natural communities for conservation by the New Hampshire Natural Heritage Bureau. 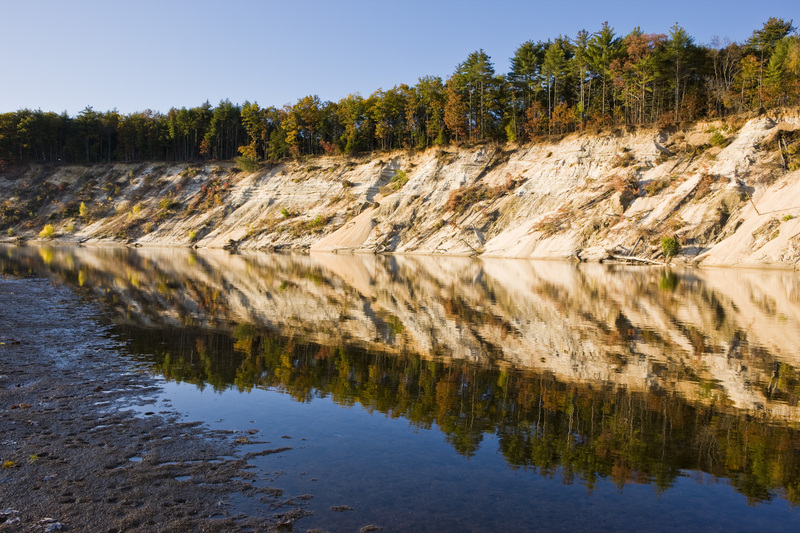 The land also protects the underlying aquifer formed 10,000 years ago by glacial Lake Merrimack. In addition to its scenic value, the property has been enjoyed by the residents of Canterbury and neighboring communities for hiking, snowshoeing, fishing, and hunting. Common Wildlife: Bank swallows make their homes in the river bluffs. The land’s forest, wetlands, and shoreline supply a diverse mix of habitats for waterfowl, migrating songbirds, turtles, amphibians, and the occasional bald eagle and osprey. The uplands support bear, dear, and turkey. The woody debris and shaded river edge, as well as the protection of the river bed itself, all contribute to safe passage of anadromous fish from the ocean to headwaters spawning grounds. Special Notes: Prior to acquisition, this property was proposed by a private developer for a new regional landfill. 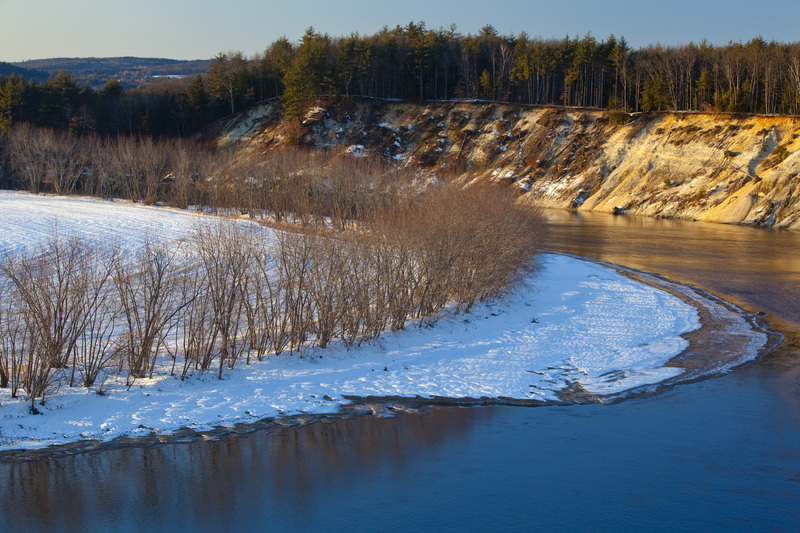 Citizens and activists of the Town of Canterbury and surrounding communities formed the “Oxbow Initiative” to kill the landfill proposal and support permanent conservation. The group was instrumental in helping to raise funds for the lands permanent conservation. Directions: From Exit 17 off Interstate 93, take Rte 4 East. In about ½ mile, take a right onto Old Boyce Road; continue onto Riverland Road. Park at the gate and walk in along the pathway, past the bluffs, to the property boundary marked by bolders.